This past week due to CA Star Testing and being a student teacher, I had the luxury of time to sew. I took advantage of those few mornings in which I didn't have to teach until 12:47pm (was that ever weird) and sewed....sewed something super fun and a first for me. I sewed up a baby/toddler quilt! I say baby/toddler because I purposefully made this quilt top larger (54"x 47") than the traditional baby quilt so that it could be used longer, if wanted. 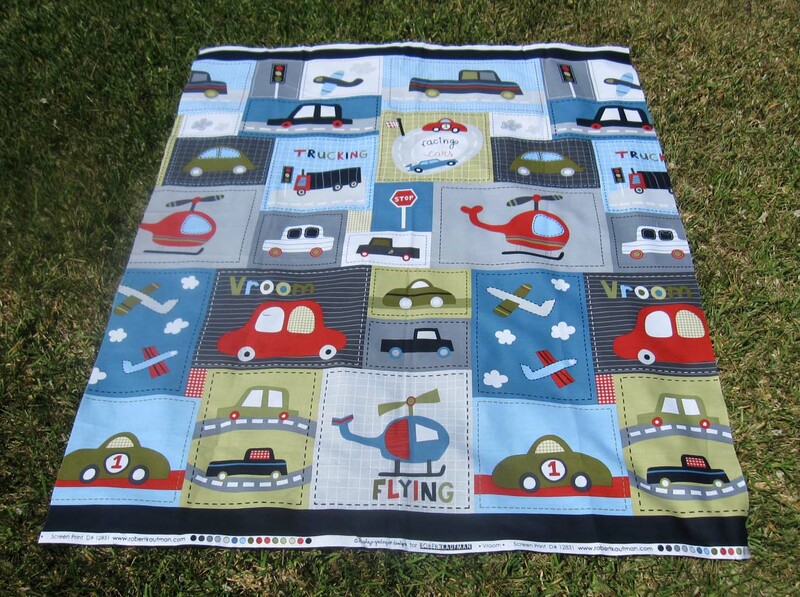 Months ago I knew that a special friend from school was having a baby boy in the Spring, so I had picked out Vroom by Lesley Grainger fabric because of the colors and the theme it invoked - transport/movement/progress/travel. After finding the perfect pattern, I began ironing and cutting fabric last weekend. The Helicopter is so whimsical....I love it. 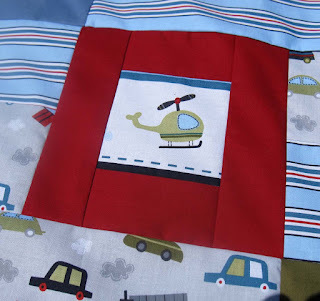 I'll be using the panel from the same line (Vroom) for the back of the quilt, although I'll need to add a border in the various solids I used on the front to bring it to the same size as the quilt top. 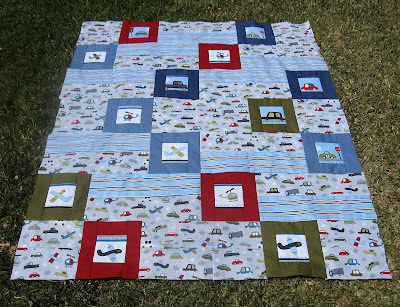 I've had so much fun working on this quilt just imagining how this little boy might enjoy it someday. Such a cute quilt, Susan! I love the name, it's so fitting to the fabric line! :)) I'm sure it'll be cherished in the years to come! Good to see you here. Missed you. Love you boy quilt. How nice you had some sewing time! The quilt is darling - and what a fun panel for the back! You did a really nice job suiting fabric to pattern, Susan. I can't imagine it in anything less interesting now. Woohoo, a start to finished quilt! What a fun quilt, Susan! Great choice of fabric for a little boy. Glad you got a little break and some sewing time! Only a few weeks until summer! Lucky you to have sewing time! That quilt is adorable! 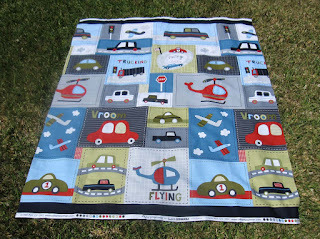 I try, in general, to do the same with baby quilts; make them a little bigger. I fit them to a crib mattress but add overhang so they can be used on a toddler bed. That is one blessed baby to get a quilt from you!